What Can IR Do For the Cancer Patient? Interventional radiologists are involved throughout the process with cancer patients. It begins by using mammogram, xray, CT scan, or ultrasound to identify the cancer. We perform minimally-invasive needle biopsies to obtain tissue samples in order to diagnose the cancer. Under ultrasound or x-ray guidance, we also place long-term IV access devices such as mediports, port-a-caths, or other types of catheters that are used for chemotherapy. Direct treatment of the tumor by chemoembolization, cryoablation, or radio frequency ablation is also performed by interventional radiologists. 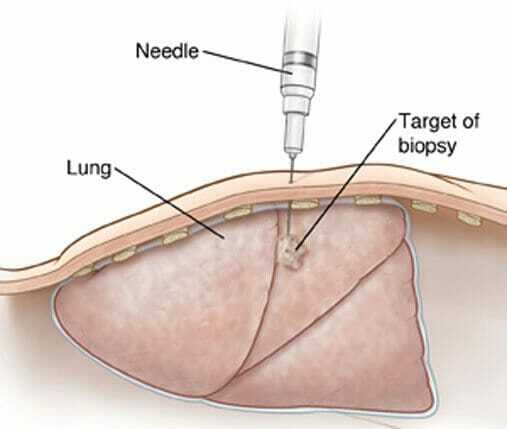 Needle biopsy, or image-guided biopsy, is usually performed using a moving x-ray technique (fluoroscopy) computed tomography (CT), ultrasound or magnetic resonance (MR) to guide the procedure. In many cases, needle biopsies are performed with the aid of equipment that creates a computer-generated image and allows radiologists to see an area inside the body from various angles. Needle biopsy is typically an outpatient procedure with very infrequent complications; less than one percent of patients develop bleeding or infection. In about 90 percent of patients, needle biopsy provides enough tissue for the pathologist to determine the cause of the abnormality. recovery times are usually shorter and patients can resume normal activities sooner than if they have surgery. 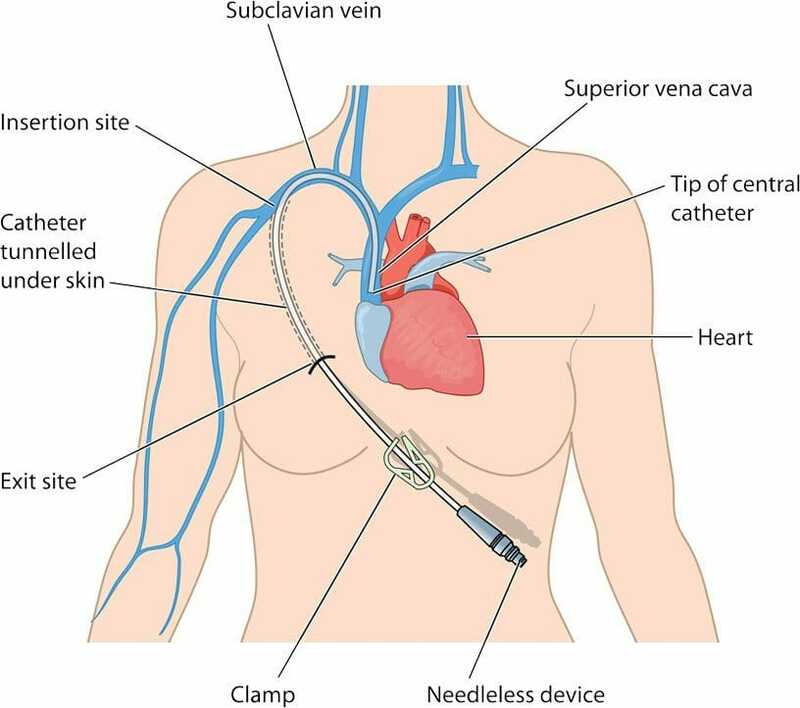 A central venous access catheter is a tube that is inserted beneath your skin to provide a simple, pain-free way for doctors or nurses to draw your blood, give you medication or nutrients. When you have one, you are spared the irritation and discomfort of repeated needle sticks. More than 3.4 million catheters are placed each year, and doctors increasingly recommend their use. There are several types, including tunneled catheters, peripherally inserted central catheters (also called PICC lines), dialysis catheters and implantable ports. The implantable ports are the devices most used for chemotherapy. 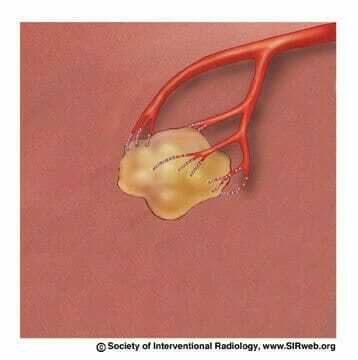 In this procedure, the interventional radiologist guides a small needle through the skin into the tumor. From the tip of the needle, radiofrequency energy is transmitted to the tip of the needle, where it produces heat in the tissues. The dead tumor tissue shrinks and slowly forms a scar. It is ideal for nonsurgical candidates and those with smaller tumors. This type of treatment is for tumors in the soft tissue of the lung, liver, kidney and breast. 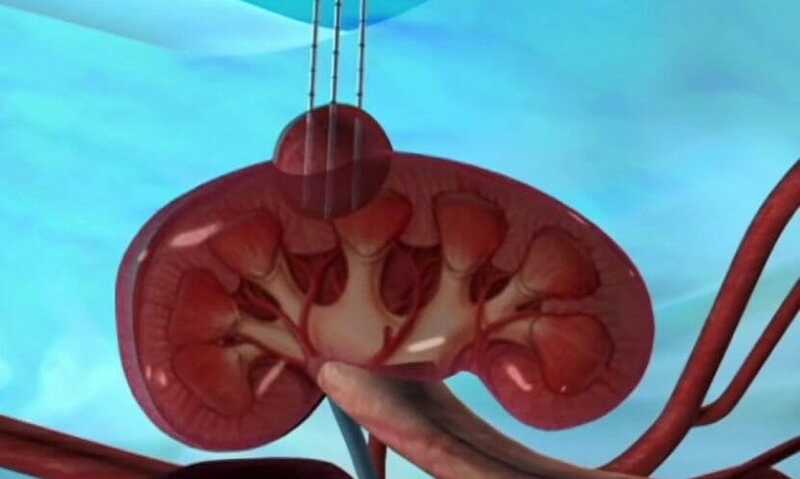 Depending on the size of the tumor, RFA can shrink or kill the tumor. Because it is a local treatment that does not harm the surrounding healthy tissue, it can be repeated as often as needed to keep patients comfortable and it is a relatively safe procedure with low complication rates. By decreasing the size of a large mass or treating new tumor as they arise, the pain and other debilitating symptoms caused by the tumors are often relieved. The tumors themselves may not be painful, but when they press against nerves or interfere with vital organs they can cause pain. RFA is effective for small to medium-sized tumors and emerging new technologies should allow the treatment of larger cancers in the future. 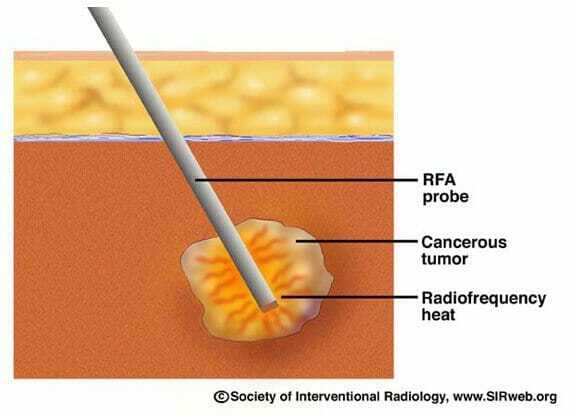 Cryoablation is similar to RFA in that the energy is delivered directly into the tumor by a probe that is inserted through the skin. 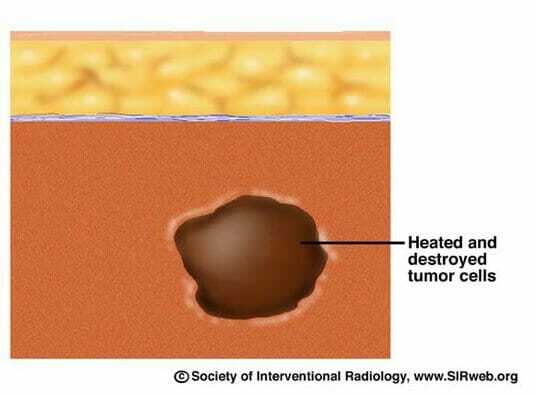 But rather than killing the tumor with heat, cryoablation uses an extremely cold gas to freeze it. This technique has been used for many years by surgeons in the operating room, but in the last few years the needles have become small enough to be used by interventional radiologists through a small nick in the skin without the need for an operation. The "ice ball" that is created around the needle grows in size and destroys the frozen tumor cells. This technique has been used successfully for liver, breast, bone, lung and kidney tumors. The benefits and potential complications are similar to those seen with RFA. 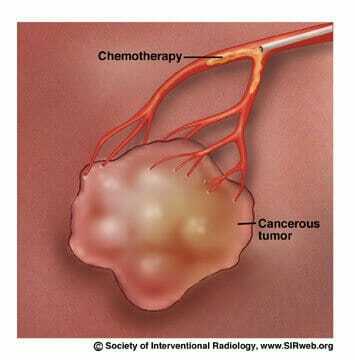 Chemoembolization delivers a high dose of cancer-killing drug (chemotherapy) directly to the organ while depriving the tumor of its blood supply by blocking--embolizing--the arteries feeding the tumor. Using imaging for guidance, the interventional radiologist threads a tiny catheter up the femoral artery in the groin into the blood vessels supplying the tumor. The embolic agents keep the chemotherapy drug in the tumor by blocking the flow to other areas of the body. This allows for a higher dose of chemotherapy drug to be used because less of the drug is able to circulate to the healthy cells in the body. Chemoembolization usually involves a hospital stay of two to four days. Patients typically have lower than normal energy levels for about a month afterwards. 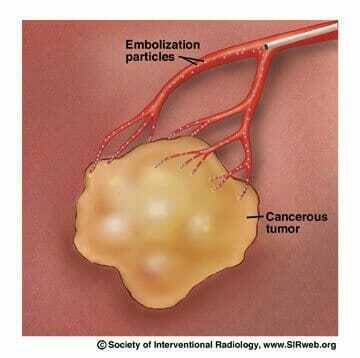 Chemoembolization is a palliative, not a curative, treatment. 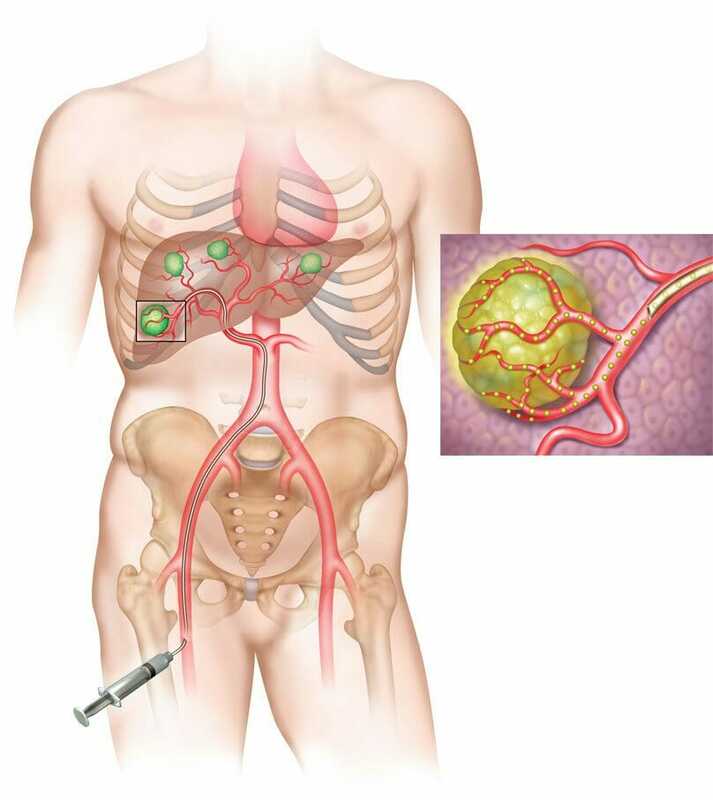 Chemoembolization has shown promising early results with some types of metastatic tumors. In this treatment, the radioactive isotope Yttrium-90 is placed into embolic spheres to deliver radiation directly into the tumor via a catheter. The catheter is inserted into the femoral artery at the groin and is moved directly into the artery supplying the tumor. 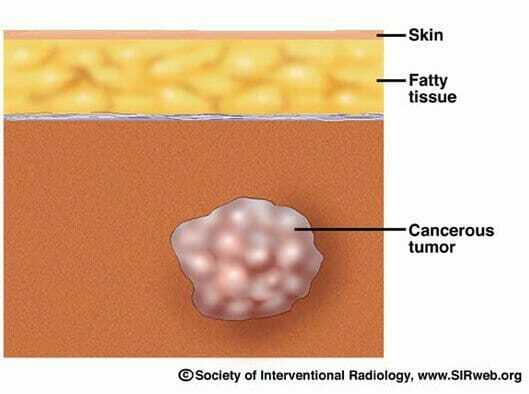 The spheres become lodged within the tumor vessels where they exert their local radiation that causes cell death. This technique allows for a higher, local dose of radiation to be used without subjecting healthy tissue in the body to the radiation. The Yttrium-90 radiates from within and since it is administered in the hepatic artery, it can be viewed as "internal" radiation. Radioembolization is a palliative, not a curative, treatment it can help patients extend and enjoy a better quality of life. It is performed as an outpatient treatment. There are fewer side effects from this treatment compared to standard cancer treatments.